With the August primary coming up, the two Democratic candidates running for the State Senate seat took to airwaves with a series of appearances on local access television. 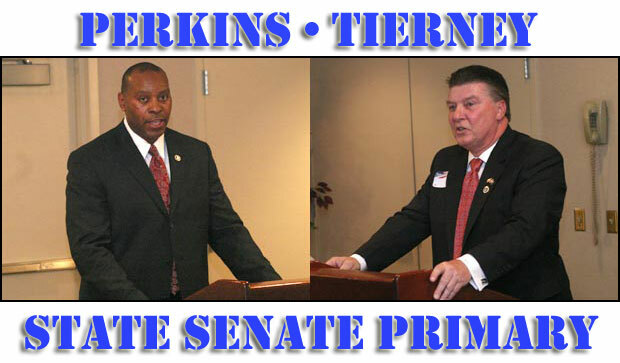 On Tuesday, Duane Perkins made an appearance on "Bethel Today" where he discussed his background and presented his platform while on Wednesday night, Terry Tierney participated in a hour long live call in show where he took questions on a series of issues. Here are the videos of their appearances. That's what CQ politics is saying about the 4th Congressional race between Chris Shays and Jim Himes. Rep. Christopher Shays ' ability to withstand strong Democratic challenges even in unfavorable national climates led CQ Politics initially to rate this race as Leans Republican, but former investment banker Jim Himes is expected to present a serious challenge that will be aided by coattails from the presidential race. Mark my words, the only race that's going to be interesting is in the 4thCD. I have to offer a h/t to hatcityblog.blogspot.com for their in depth and continuous coverage of this scandal - and clearly identifying the real public demon (apart from the thug Galante) and that is Mark Boughton. And now Boughton's henchman/chief of hate-mongering Machlachlan is running for state senate to further poison Danbury's reputation. Here is another corrupt tool looking to infiltrate the Capitol - another hate-mongering, fear-mongering dirty-handed, corrupt politician seeking to replace Cappiello (who looks like a saint comparatively). You mean that chief of staff McLaughlin who reportedly turns red-faced and loses his temper and ...(I know, I know...keep my mouth shut). I hate to sound like I am defending Cappiello here, but I am intimately familiar with campaign finance at the state senate level and have been a treasurer many times, so I must provide insight. I would indeed be shocked if Cappiello knew of any of this when the donation was recorded. Senators rarely do more than skim who gives to them (some don't even know how much money they have, let alone who gave)and I have only seen a few who really scrutinize who did give, but those folks are really looking for who didn't give and pay a lot more attention to who gave to their opponents. Now that being said...once the Galante sh!t hit the fan, a smart politician - and certainly one with aspirations for higher office - would go over all of their past filings with a fine toothed comb, uncover anything suspicious, and bring it to the attention of the proper authorities. Instead, Cappiello is shocked, Boughton claims stupidity, and DeLuca...well we all know what DeLuca did. Oh, did I mention that, unlike Cappiello, Boughton to this date STILL hasn't given back Galante's dirty money? Tick-tock, tick tock...it will be September before you know it and the REAL interesting Galante trial begins. 1. Tonight at 9 P.M., I'll be a co-host on the cable access show Ideas at Work and Beyond. Our guest will be State Rep. John Frey (R-111th District) followed up with a round table discussion on all the local nonsense. Joining the roundtable with Host Marty Heiser and myself will be former City Clerk and mayoral candidate Helena Abrantes. If you're outside of the Comcast range, don't fear...the show will not be broadcasted live in real time on the internet (we'll, I'm trying out the feature for the first time tonight). UPDATE: The internet feed didn't go off as well as expected so I'll try again next week. You will be able to view tonight's episode here starting at 9:00 PM or at the show's official blog. 2. Just put the finishing touches on the new section of this site dedicated to the elimination of the position of City Clerk. Thanks to all of the people who helped make this special edition of HatCityBLOG happen and I'm very excited to show off the new features. Hopefully after 20+ years of trying, we can finally get a charter revision commission to do the right thing and bring an end to one of the most useless positions at City Hall and have a replaced with a NON-POLITICAL, civil service staff (which won't be presiding over weddings or yapping it up with the Registar of Voters during the day). 3. The new show is only a signing of the contract away. Seeing that certain local bigot/wedding d.j./former disgraced "special" police officer/pathetic hotdog vendor who mysteriously changed his last name is still spreading B.S. and is still whining about the live show he produced canceled and being correctly exposed by the press throughout Connecticut as a disgusting low-life hate-monger who wants members of the immigrant community SHOT ON THE SPOT, I decided to speed things along a bit in an effort to put an end to the nonsense. Had to put things on hold while I learn new video software but I think we're at a point where the show can move forward. 4. I'll be presenting some of my video archive to a number of national organizations that are interested in what occurring on Danbury. Hopefully, the racism, xenophobia, and it's connections to policy at City Hall will get the true national attention it deserves. 5. Remember, HatCityBLOG is now a member of the AmericaTowns community. 6. If your a business, campaign, or someone looking to promote something that's happening in the area, you can always place an ad on this site. It's cheap and VERY easy. Email me at hatcityblog@yahoo.com for rates. 7. There's more stuff on the horizon but I have to keep my mouth shut due to my annoying legal counsel who's has me on a tight leash. 8. In honor of the worse hot dog vendor in Danbury (and a shot across the bow to the OTHER LYING xenophobes who will be receiving their 15 minutes of fame courtesy of yours truly REAL SOON), here's a trip back in memory lane from one year ago. You thought last year's exposure of the Big(o)T was a eye-opening...trust me, you haven't seen nothing yet. First it's the illegal bundled campaign donations from James Galante, now it's this. The State Elections Enforcement Commission adopted a stipulated agreement today to settle a case which originated from a referral by the United States Attorney. The settlement was reached with two attorneys from the Danbury area: Jack Garamella and Christopher Leonard. Both are partners in the law firm Collins, Hannafin, Garamella, Jaber & Tuozzolo, P.C. Each attorney paid the maximum $2,000 civil penalty under these facts for making a contribution in the name of another. Jack Garamella gave $500 to Chris Leonard and asked him to make a $500 contribution to the 2004 re-election campaign of State Senator David Cappiello, because he did not wish to be identified as giving a contribution to a Republican while he was seeking the Democratic office of Judge of Probate. Leonard made a prohibited contribution by accepting the money, and then writing a check in his name to the Cappiello campaign. The Commission imposed the maximum civil penalty as it considers this a serious violation. Concealing the true source of a candidate contribution frustrates the purpose of disclosure laws. UPDATE: Click here to read the stipulated agreement between Garamella, Leonard, and the State Elections Enforcement Commission. "I was stunned," Cappiello said. Hmm, this reaction sound familiar...oh yeah, Cappiello's reaction to James Galante's contributions to his campaign. You remember, the trash hauler with ties to the mob who also gave illegal bundled campaign donations to former State Senator Lou DeLuca and Danbury Mayor Mark Boughton. "He was a philanthropist - at least I thought he was," Cappiello said. UPDATE 3: and just who is Jack Garamella? Garamella, a senior partner with the Collins, Hannafin, Garamella, Jaber and Tuozzolo law firm on Deer Hill Avenue, has served as [James] Galante's corporate attorney and was president of New Fairfield Sanitation, a Galante-affiliated company. Federal investigators raided Garamella's office three years ago and seized more than 50 boxes of documents and several computers, attorneys said at the time. An indictment last summer charging Galante with racketeering, however, alleged Galante and his associates "orchestrated campaign donations through straw donors who were then reimbursed in cash." Galante was charged last fall by officials of the Chief State's Attorney's Office with six counts of violating elections law for using straw donors to contribute money to several politicians, including Mayor Mark Boughton, former state Sen. Louis DeLuca and Cappiello. Those charges are still pending. The only person "stunned" over this development is Cappiello. BTW: Just who is Chris Leonard? oh nobody important...just the former Chairman of the Ridgefield Republican Town Committee. Asked if things had calmed down since February, Boughton said there's "no doubt about it. There was a lot of over-the-top hysteria back then. I think when people listened to what we said—both the anti-illegal immigrant people and the immigrant groups—people realized we would not be doing round ups. People got comfortable with the idea [of the program]." Obviously, there will be a response to this latest load of garbage Boughton unloaded on the Fairfield Weekly. I think this just about sums up everything you need to know about John McCain and his view on the Iraq war. State Rep. Bob Godfrey fundraiser 07.19.08 photo by CTblogger. Since we're in the middle of the campaign season, I decided to dust the camcorder off and go out and interview candidates who are running for state office. Starting locally, my first stop was to State Rep. Bob Godfrey's fundraiser. Held on Saturday afternoon, residents who make up the 110th district (Danbury) as well as local politicians (and an appearance by Majority Leader Chris Donovan) came out to show their support for the Deputy Speaker. 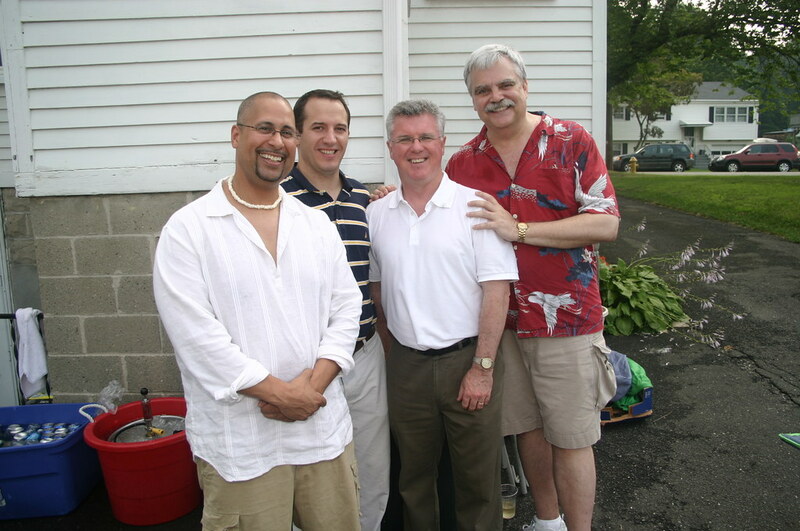 Back during the 2007 election, Democrats went out and collected over 1,000 signatures from residents in Danbury who wanted City Hall to resind Boughton's SEVEN YEAR the tax giveway to BRT. From October 30 2007, here's the Democrats pres release on their oppositon to the BRT tax deferral. Prominent Danbury Democrats are calling for the repeal of the seven-year tax assessment deferral for the BRT property at 30 Crosby Street. Helena Abrantes, Democratic Candidate for Mayor, said, "Mark Boughton and the Republican controlled Common Council have ignored the opposition of this tax giveaway and the Ad Hoc committee appointed to consider repeal has been delaying any resolution of this issue." Abrantes stated, "I have the signatures of hundreds of Danbury Taxpayers who demand an answer from their elected officials and want a decision from the Republican controlled Ad Hoc Committee so the entire Council can move forward with the repeal." "This is the FIRST time in the City's history that a tax deferral was offered for any residential development. There is no benefit to the City or its residents that would justify such a windfall to a single corporate real estate condominium developer, especially recognizing BRT went back on its word regarding the marketing of these apartments on Crosby Street," Abrantes concluded. Tom Saadi, Democratic Council Leader, who opposed these condo tax abatements from the beginning, said, "We are demanding repeal, especially in light of the developer's 'bait and switch' change in use." BRT originally attempted to justify the tax abatement for its Crosby Street project by claiming it would be bring young professionals to downtown and have an overall positive effect on economic development and revenue for the city. However, this is an unprecedented use of tax deferrals. In contrast, tax deferrals for the recruitment, retention and/or expansion of Cendant Mobility/Cartus, GE Capital, Belimo and MannKind Pharma provide quality jobs and produce a significant economic benefit for the City of Danbury. Councilwoman Lynn Taborsak stated, "There are no jobs created, no additional businesses started and no benefit that warrants a multi-million dollar giveaway of both tax dollars and reduced hookup fees for sewer and water. Homeowners in my neighborhood on Jackson Drive, Woodbury Drive and Hawley Road had to pay full-freight for their water and sewer hookups. Why couldn't they get a sweetheart deal like BRT?" Councilman Ben Chianese said, "The original plan for this project was thrown out the window. Now this project has no resemblance to the plan that was approved by the previous Common Council. As a city, we cannot afford these tax giveaways for residential developers. As Democratic officeholders and candidates, we will demand that the Ad Hoc Committee meet to resolve this issue and we will push for repeal." Here's the video from the press conference. 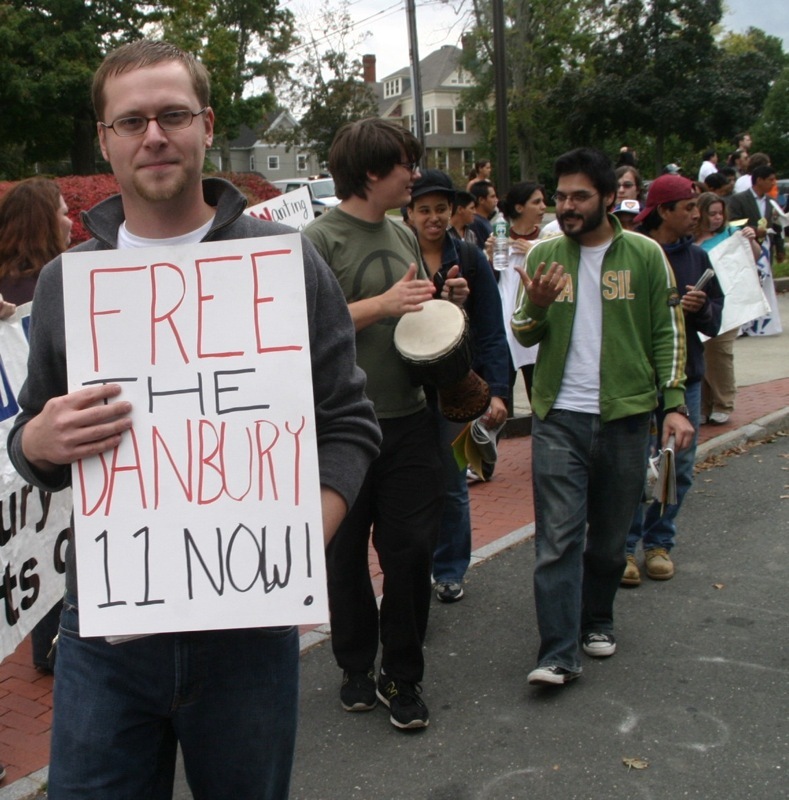 Back in April 2007, I allowed Danbury Democratic Town Chairman Joe DaSilva the oppurtunity to do a guest post to talk about several issues in Danbury. One of the biggest criticisms he had was directed towards Mayor Boughton and the absurdity in the mayor granting a SEVEN YEAR tax deferral to a residential developer. The current housing controversy in Danbury concerns the granting of tax deferrals to a major developer for the development of two large developments in downtown Danbury. Specifically, the City of Danbury approved, on the urging of Mayor Boughton, the granting of a seven-year tax abatement for the construction of a 115 unit apartment building on Crosby Street and the development of over 500 condominiums on Kennedy Avenue. 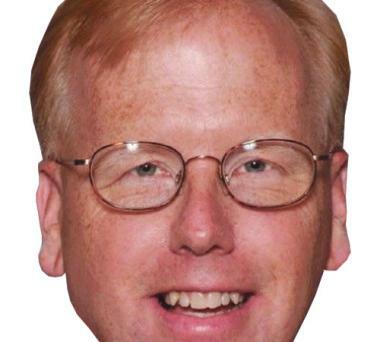 Mayor Boughton stated that he wanted to spur market rate housing in downtown Danbury and claimed the tax give away would be necessary because otherwise no developer would commit to the down town. This claim and the project were both absurd and damaging to the future of Danbury. First, tax abatements were not necessary and claiming they were is nothing short of insulting the intelligence of Danbury residents. Unnecessary: There are many projects in downtown Danbury overseen by responsible developers committed to Danbury that didn't receive such breaks. For example: new three bedroom condominiums are being built on the corner of Division Street and Park Avenue. For example: several years ago the Nolan family developed the Harrison Square apartment project on Main Street. For example, the Nolan family has rehabilitated several multi-family houses on Terrace Place in downtown Danbury. None of these developers received a windfall in the form of a tax abatement; yet they committed their time, energy, vision and money to creating real housing opportunities in downtown Danbury. Damaging: the tax abatements will cost the City of Danbury millions of dollars in lost taxes and lost sewer and water charges. Moreover, the developer has decided to market the rental building on Crosby Street to college students as an alternative to dorm living. I hold two degrees from Western Connecticut State University. I truly believe the college adds a lot to the City of Danbury and I have no problem with the concept of college students living in downtown Danbury. I do, however, recall that the reason the mayor and the developer gave for the granting of the tax abatement was to spur economic development through the creation of market rate housing in the downtown area. Even if you agree with this argument, it is hard to envision exactly how much economic activity will be generated by college students! The 500-unit complex on Kennedy Avenue hasn't even begun yet. Once its open, however, this will generate traffic on an already congested downtown. Moreover, this will generate burdens on the Danbury Schools and the Police and Fire Departments. Yet while this project will create these burdens to the owners will not be contributing to the costs because of the tax abatement. Instead, the rest of the property owners in Danbury will have to carry these costs for seven years! Food for thought when you NOW read how the mayor is now on board with the Democrats amendment that would not allow BRT to do what they're doing now with the apartments on Crosby (a.k.a. turning them basically into a college dormitory). In an attempt to educate people of Mayor Boughton and the Republican's defense of the SEVEN YEAR BRT tax giveaway, I'm going through the HatCityBLOG archives to give everyone a historical view on how Boughton defended BRT and repeatedly dismiss attempts from the Democrats to address the use of the BRT Crosby complex (a.k.a a college dormitory) The following video was posted last May. In another example of local government out of control, from May 22, 2007, here's video footage of the BRT tax deferral ad-hoc committee meeting. When you watch this meeting, PLEASE take note that the purpose of the meeting was about whether or not the tax deferral should be rescinded. Also take note of what was allowed to be presented THAT HAD NOTHING TO DO WITH THE PURPOSE OF THE MEETING (slide show by BRT about them helping out Western Connecticut State University, Mayor Boughton's spin speech), what was NOT allowed (questions from the lone Democrats on the ad-hoc) and the answers to the FEW questions the Democrats were able to present ($7,000.00+ in rent collected from each student, the amount of money BRT will collect from the tax giveaway, who will be responsible to police the area). Like I said earlier, I'm dedicating today to outlining how Mayor Boughton and the Republicans on the common council are backpedaling on their defense of the BRT SEVEN YEAR tax giveaway. Boughton's flip-flop has outraged those who have attempted to address the BRT tax giveaway or YEARS only to be dismissed by the mayor or Republicans on the Common Council. From June 2007, here's then Common Council members Fred Visconti and Lynn Taborsak talking about Mayor Boughton's BRT SEVEN YEAR tax giveaway on Crosby street. Brookview Commons is bringing in new people - and money to Danbury, something desperately needed downtown"
"I think the public is being sold a bag of goods..."
Mark Boughton DEFENDING the present use of the BRT/Crosby (a.k.a a dormitory for Western Connecticut State University): Danbury News-Times 10.30.07. The mayor also said the developer's decision to market to college students does not violate the agreement with the city, so the Democrats have no basis to ask that the tax break be repealed. Now, this is just a snapshot into Boughton's defiant defense of his BRT SEVEN YEAR TAX GIVEAWAY as well as BRT's decision to use the property as a dormitory, and his dismissal of the Democrats attempts to question and/or recind the tax giveaway. After over a year of the Democrats attempting to do someting about the BRT tax give-away (only to be blocked), and NOW in the current economic environment, the Republican-controlled Common Council and the same mayor who was SO defiant in his support of his SEVEN YEAR tax break to BRT as well as BRT using the condo complex as a dormitory have a change of heart. Democrats want to tighten a law that gives tax incentives to developers and companies looking to do business in the city. Common Council member Thomas Saadi wants the law tweaked so if a developer receives a tax incentive for given a project -- and then the nature of the project changes -- the tax incentive is abandoned unless the issue comes back to the Common Council for review. Mayor Mark Boughton, a Republican, agreed. "There are some unanswered questions, and it may require some tweaking, but the larger idea of having a project come back for reauthorization if there is a substantive change makes sense," Boughton said. This is a textbook definition of hypocrisy...and luckily I have over a year of video footage of Boughton and the Republican controlled Common Council defending the tax giveaway and BRT's decision to use the property as a dormitory. NOTE TO EUGENE DRISCOLL: It might be wise to call the mayor out on this OBVIOUS FLIP-FLOP since I took the quotes from Boughton from BOTH OF YOUR ARTICLES (10.30.07 and 7.12.08). As I place the finishing touches on "Abolish the position of City Clerk" section of this site, I wanted to give everyone a preview on what's to come. As demonstrated in previous posts, calls for the elimination of the City Clerk position is nothing new. Attempts to have the position scrapped and replaced with a civil service staff go as far back as the moment the town and city of Danbury were combined but for blocked basically due to partisan politics. If there is any reason the position should be eliminated, one needs to look no further than the gross incompetence of the present City Clerk Jean Natale. From routinely not being in her office to service the people of Danbury, performing weddings during the time when she should be in her office, and spending more time joking around with Mary Ann Doran in the Registar of Voters office (thus again, not being available in her office), to using the office of City Clerk for partisan politics, being admonished by the Freedom of Information commission, embarrassing the city while standing next to an anti-immigrant white supremacist skinhead, and not fulfilling requests from council members in a timely fashion, Natale is the poster child for everything that's wrong with the position of City Clerk. As we now have a chance to finally rid ourselves of this useless position, here's another comment from someone who knows a thing or two about the position of City Clerk...since she was the ASSISTANT City Clerk for a number of years. Take note of the person's comment regarding the City Clerk at the time (2001-2003) who happened to be former mayoral candidate Helena Abrantes. From the Danbury News-Times dated Oct 11 2002.